Where I live, there is quite a lot of rain. It’s the wet side of the island, the windward side, facing the north east. The leeward side of the island, facing the southwest, is a lot drier and sunnier, with less rain. 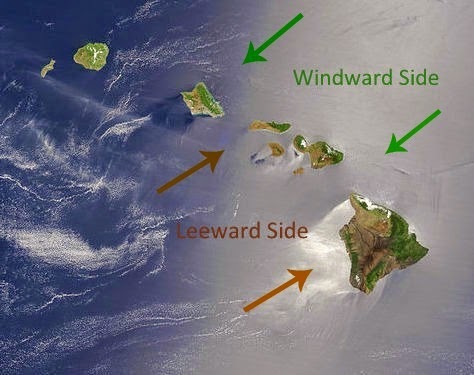 This is true for all the Hawaiian Islands – there is a leeward side and a windward side. Also, it’s true, the windward side is windier too… bringing the rain from the trade winds into the island. For tourism, the major resorts are generally located on the drier, leeward side. This makes sense because who would want to fly all the way to Hawaii for vacation and deal with a week of rain and gray skies? Even though it's warm and comfortable rain. The windward side of the Hawaiian Islands get trade winds from the NE and more rain. They are also more lush. The leeward side of the islands are drier and sunnier. This photo is altered from a NASA satellite image (public domain) on Wikipedia Commons. But from time to time, it does happen. I remember one week that the TV news was going crazy reporting the weather in Honolulu. There were gray skies and downpours all week long. There were some very unhappy tourists in Waikiki. Luckily, there is a secret to the rain in Hawaii. The rain clouds are often very localized, meaning that it can be pouring rain in one place, and just a mile up the road, or maybe a few miles or maybe twenty miles, there is beautiful sunshine. By the way, Hawaii is home to three of the wettest spots on Earth, Mt. Wai'ale'ale on Kauai, Big Bog, and Puu Kukui on Maui. 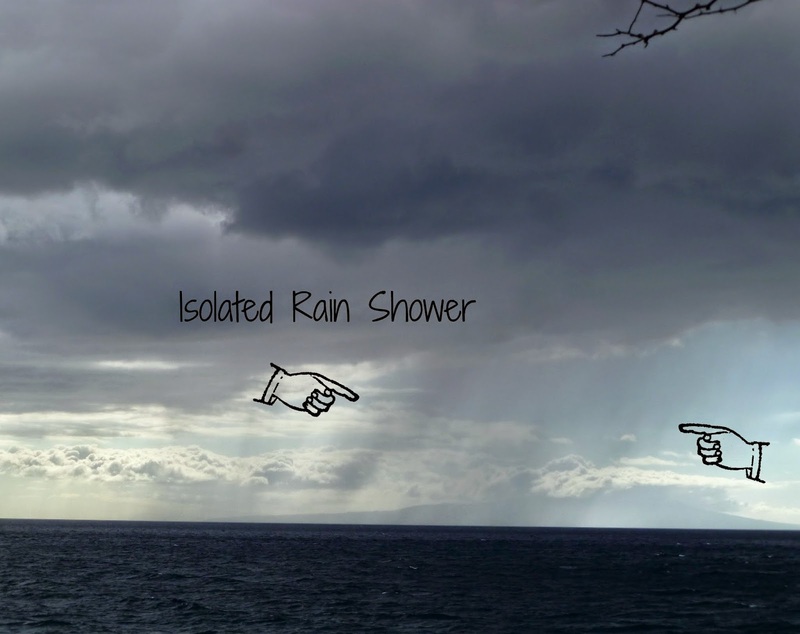 An isolated Maui rain shower between the two hands. The cloud line, separating the overcast (potentially rainy) area from a bright sunny area just down the road. This cloud line seems to occur throughout Hawaii. I've seen it on Kauai as well. Don’t despair if you’re on vacation in Hawaii and it starts raining. Just keep driving. 9 times out of 10 you can find somewhere sunny. The rain can also come and go very quickly. It can be raining, then it’s sunny, then it’s raining, then it’s sunny and raining! Wait! How is that possible? It just is… we call rainy sunshine or sunshine-y rain, liquid sunshine in Hawaii. There is even horizontal rain… sneaky rain that, even though there seems to be no wind, is coming down sideways! There are also sneaky rain clouds. My husband tells a story of watching a rain cloud follow a man up and down through the streets of Waikiki. All around him it was sunny, but it was raining on him. He had his own personal rain cloud. Right now we’re in rainy season, what we consider our “winter.” There is also a drier season, what we call “summer.” This year, even the dry, leeward side of Maui is getting a lot of rain, though there is still plenty of sun. This is one of the wettest winters we’ve had in years. The rain brings gifts too. There’s a local saying here, “No rain, no rainbows.” It’s a good attitude to have. OH, I really want to share this wonderful resource: Glenn's Weather Report. 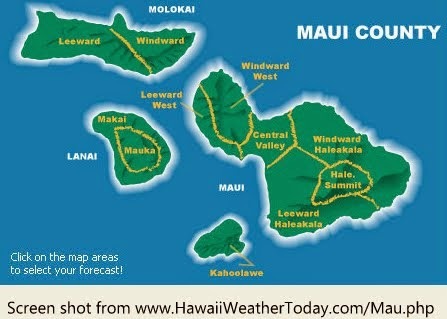 Different parts of the island (all Hawaiian islands) have different weather conditions! So click on an island, and then click on the area of the island you're interested in. Seriously, Hawaii Weather Today is such a helpful website. Conditions can be completely different from one side of the island to the next. The weather at Haleakala Summit is particularly unpredictable and can change rapidly. Thank you for teaching me a little something about Hawaii, a place we call paradise. Great pics, even if they announce rain. We need it here in So. California -- need it badly. I will second the comment that we need more rain in So. Cal. I could deal with a week of rain. Our rain is spotty too. We live in an area with a thermal updraft so the rain clouds split and go around us on either side. If I were visiting Hawaii, I wouldn't complain about the rain. Everyone knows it rains there. Good! Glad to hear that everyone knows that!. Yes, So Cal could use rain, not flooding rains, but enough to keep crops moist and restore reservoirs.